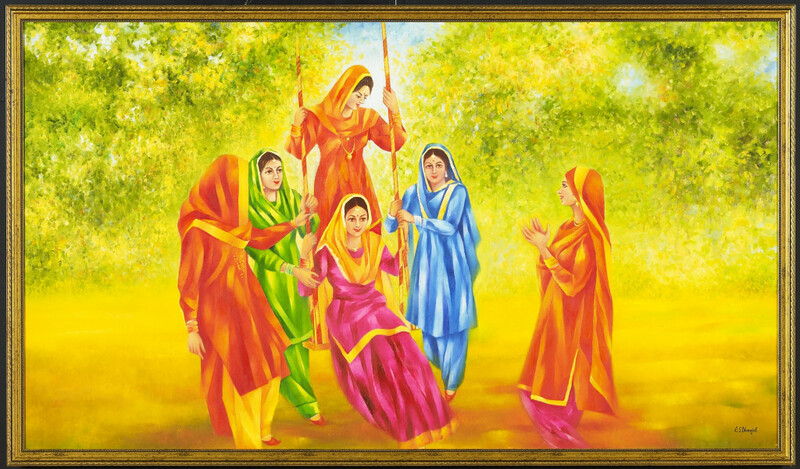 The tale is aptly titled How Raja Rasalu swung the seventy fair maidens, daughters of the King, and it is from Punjab. Raja Rasalu, "tender-hearted and strong" (a popular Punjabi hero) rescues a cricket from a forest fire, and the cricket promises to return the favor. 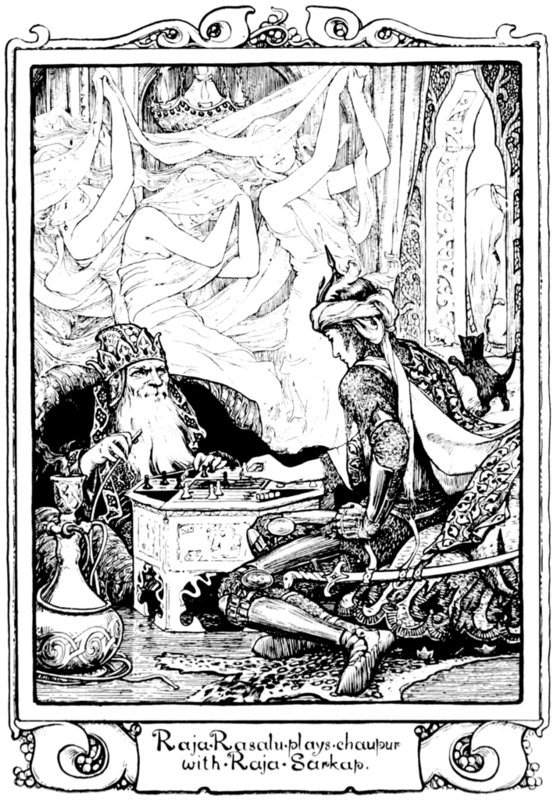 The Raja visits a King who has seventy daughters (whew! ), and falls in love with the youngest princess. The other sixty-nine get jealous, and decide to give him tasks to win their sister. First he has to separate a hundredweight of millet seed from a hundredweight of sand - which he does successfully with the help of an army of crickets. Second - he has to swing all seventy maidens in swings until they are tired. Raja Rasalu tells the girls that he has no time to swing them one by one - if they want to be swung, they all have to get into one swing. 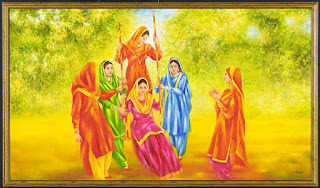 The girls all pile in, "merry and careless, full of smiles and laughter," and the Raja fastens the swing rope to his mighty bow, shooting an arrow into the sky. The swing goes up and up and up, pulled by the arrow - and when it swings down, the Raja draws his sword and cuts the ropes. All seventy girls fall out, getting bruises and broken bones - except for the youngest, who lands on top of the pile. The Raja also breaks seventy drums and seventy gongs; the father of the maidens then tries to poison him, but doesn't succeed. In one version of the story, a whole lot of other adventures follow; the others end kind of abruptly. Is that really a way to impress your love, by sticking her on a crazy swing with her sisters and then breaking it? Hmm, one had to wonder! Now, making a knot of spilled brandy sounds like an interesting runner up! I'd never heard this story before. I'm surprised he was still motivated enough to want to marry her, after all those adventures. The things they think up to test love. Swinging 70 maidens. This was a fun read. Will ask some Punjabis whether they've ever heard this lovely tale. I imagine there was a great deal of screaming involved with the swing. Also, from the runners up - spitting at one's wife does not seem to be a very proper greeting. I'm thinking that I need to get all my family to heave some cakes at their uncles some time, because otherwise I won't be able to recognize them from the way they throw cakes into the faces of old uncles. I mean, do you recognize the distinctive manner in which your loved ones throw cakes int he faces of their uncles? That must have been a huge swing! Another interesting post. I don’t find this one as bizarre as the fried fingernails, but still meets your “WTF” criteria. So all of the jealous girls get bruised and broken and the one he likes does not. Interesting. And I imagine he was glad of the cricket´s assistance. You know you're in fairytale land when seventy girls piling onto each other do so "full of smiles and laughter". Yeah, right. the puppy one is appalling! and some of the other runner-ups are plain freaky. the guy broke all those girls. wow. i don't know what else to say. I am so glad the father tried to poison him. I read that and couldn't help but think "Seriously? He beats up 69 of his daughters so he can get with the last one and you're going to let him get away with that? I wonder if those seventy daughters are from the same wife, or multiple wives! People in myths and folktales certainly don't operate under the same scientific rules as real people. Distinctly odd. I bet he wouldn't have enjoyed being swung by the moustache. I'd love to know how these women all piled on that swing. And even better, how did he guarantee that his love wouldn't break a bone? Interesting story. But does he win the hand of the youngest daughter after all that effort?